Hello All: I know it’s early October but now is a good time to consider purchasing a beautiful 2012 calendar full of flower images for yourself, a family member, friend or coworker as a holiday gift! 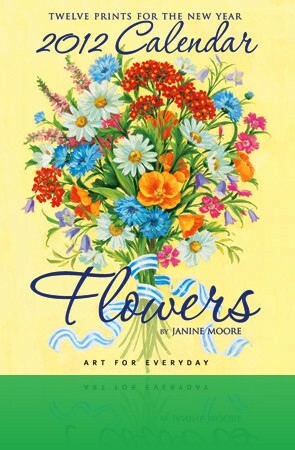 For several years, the Janine Moore “Flowers” calendar has been in my home. Next year will be no exception. I get the 11″ x 14″ calendar with 12 months of pretty, seasonal botanicals. You need to place each month’s calendar into a clear frame. I bought my frame at a local crafts store. Frames are also available for purchase with the calendar. Overall, the 2012 calendar contains lovely images of seasonal flowers – in baskets and buckets and wreaths and vases. I particularly like the tulips of March and the lilacs of May. Not too fond of the February “grandmother’s wall paper” image but it’s the shortest month so not a problem. Two notes: I’m not endorsing this calendar because Janine Moore shares my first name… (although it doesn’t hurt :-)). Her calendar art is beautiful and makes watching the days and weeks go by a pleasure. And I don’t receive anything from this artist or organization for this recommendation.